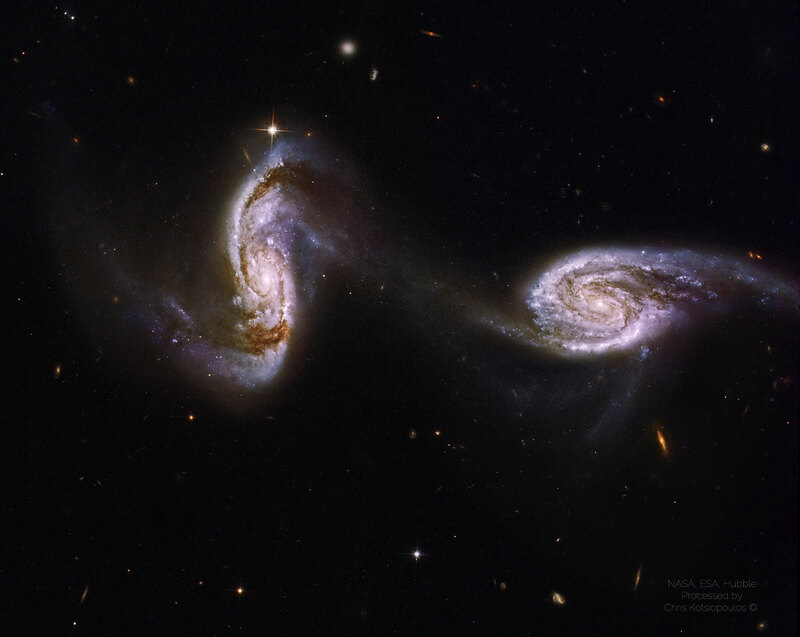 Explanation: Why is there a bridge between these two spiral galaxies? Made of gas and stars, the bridge provides strong evidence that these two immense star systems have passed close to each other and experienced violent tides induced by mutual gravity. Known together as Arp 240 but individually as NGC 5257 and NGC 5258, computer modelling and the ages of star clusters indicate that the two galaxies completed a first passage near each other only about 250 million years ago. Gravitational tides not only pulled away matter, they compress gas and so caused star formation in both galaxies and the unusual bridge. Galactic mergers are thought to be common, with Arp 240 representing a snapshot of a brief stage in this inevitable process. The Arp 240 pair are about 300 million light-years distant and can be seen with a small telescope toward the constellation of Virgo. Repeated close passages should ultimately result in a merger and with the emergence of a single combined galaxy.